It is our aim to ensure that learning takes place in an environment which gives all the children the best possible learning opportunities, matched to their individual needs. To provide a safe environment for children to perform at their best without pressures or concerns. For inter-personal relationships to play a positive part in the climate of the school. We wish to foster a happy, caring atmosphere, always welcoming, always understanding, amongst staff and children alike. To provide equality of opportunity for all irrespective of race, religion, gender, culture and disability. To develop a shared sense of purpose amongst staff, parents, governors and children. To ensure that all children perform to the best of their abilities at all times and that work prepared is adequately matched to their differing abilities. To carry out school audits to determine our priorities in the curriculum, budget, management and CPD (Continued Professional Development) through the process of self-review. To foster high teacher expectation of performance and conduct in accordance with the Standards (2012). To provide a rich spectrum of resources for the entire Primary range in order to deliver a broad and balanced curriculum. To manage our budget in order to provide the best opportunities for all within the school. To utilise the relative strengths of staff, governors, parents and community for the children’s educational benefit. To work towards the requirements of the National Curriculum regarding content and assessment. To work with the International Primary Curriculum to provide a global perspective and to provide a means of working which takes into account different methods of learning and future aspirations of living in 21st century Britain. link in well with the International Values and looking at these alongside each other gives our children both a British and a global perspective. Our values are taught explicitly through Personal, Social, Health and Emotional (PSHE), Religious Education (RE) and daily assemblies. We also teach British Values through planning and delivering a broad and balanced curriculum. The school takes opportunities to actively promote British Values through daily assemblies and whole school systems and structures such as our School Council. We also actively promote British values through ensuring that our curriculum planning and delivery includes real opportunities for exploring these values. Democracy is an important value at our school. Pupils have the opportunity to have their voices heard through our School Council. Each half term we have a new focus Value from The International Primary Curriculum; these are studied and discussed in weekly assemblies. 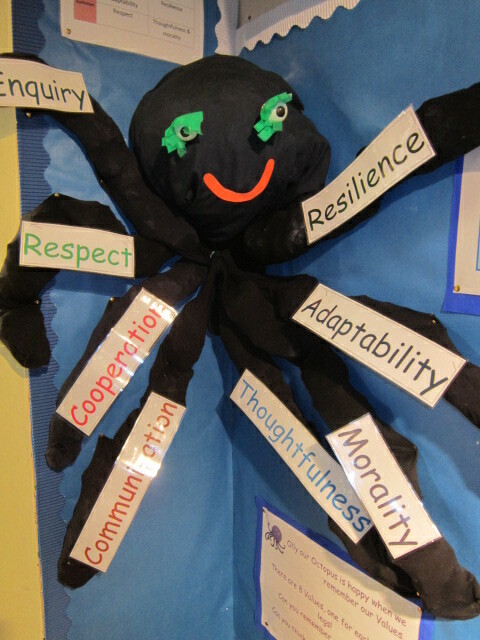 Children are encouraged to identify when these values are demonstrated within school. The importance of laws and rules, whether they are those that govern the class, the school or the country, are consistently reinforced throughout regular school days. Our system for behaviour is aligned with our behaviour policy. Children are taught the value and reasons behind laws, that they govern and protect us, the responsibilities that this involves and the consequences when laws are broken. Visits from authorities such as the police, fire service etc. are regular parts of our calendar and help reinforce this message. To encourage and promote good behaviour, attitude and work, we have devised a reward system which is consistently followed throughout the school. We are committed to praising children’s efforts. We endeavour to praise the children informally, individually, during group work, in front of the whole class and the whole school. Children are rewarded not only for achievement through ‘Best Efforts’ in curriculum areas, but for behaviour through Courtesy Points and Learning Heroes. Rewards are given in the form of bronze, silver, gold and platinum certificates for ‘Best Efforts’, points leading to awards for courtesy termly and Learning Hero Awards weekly. Children’s achievements are recognised during weekly Celebration Assemblies and end of term Award Assemblies. Pupils are actively encouraged to make choices at our school, knowing that they are in a safe environment. Children are encouraged to be independent and take risks within a safe and supportive environment through our Forest Schools programme which we call Woodland Learning. Pupils are encouraged to know, understand and exercise their rights and personal freedoms and are advised how to exercise these safely, for example through our e-Safety teaching. Our school ethos and behaviour policy are based around core values such as ‘respect’ and ‘responsibility’ and these values determine how we live as a community at Langham Village School. This is achieved through enhancing pupils’ understanding of their place in a culturally diverse society and by giving them opportunities to experience such diversity in our local community which is by large white British. We use the International Curriculum and opportunities such as the Olympics and World Cup to study and learn about life and culture in other countries. We have good links with teachers and pupils all over the World. Children write regularly to pen pals in other countries within their language sessions. We have an International Assembly every week for all children. We organise termly ‘World Days’ where we study another country and learn about their customs, practises and celebrations. We invite guest speakers and run workshops to give the children a real experience of a different culture and belief system.